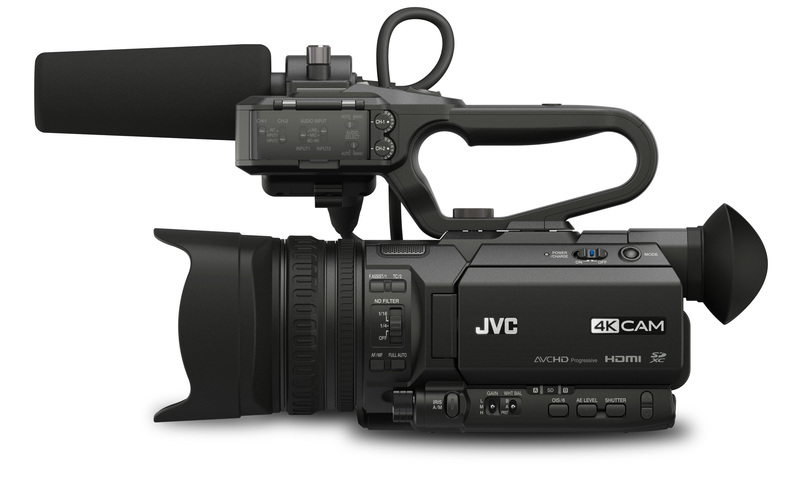 WAYNE, NJ (April 5, 2018) – JVC Professional Video, a division of JVCKENWOOD USA Corporation, today announced three new additions to its family of 4KCAM cameras. Among other new features, the new GY-HM250U offers integrated graphics and live streaming, while the GY-HM250SP adds sports-specific score overlays. Also new, the GY-HM180U sets a new benchmark for professional compact cameras without built-in streaming or graphics. Designed for enhanced single-camera production, the GY-HM250U offers lower-third and full-screen titling solutions for recorded or streamed video output without an external CG or production switcher. Lower-third graphic overlays are generated and controlled using a browser-equipped device, such as a tablet or smartphone. JVC also provides a software utility that lets customers upload logos or icons that are displayed in the lower-third of the recorded video. Full-screen graphics can be advanced manually or presented as a slideshow during extended breaks in the action with user-defined timing. Users can store up to 50 .JPG or .PNG graphics, such as team logos or religious icons, in the camera. Worship facilities, for example, can display scripture readings or lyrics, with the operator manually advancing graphics during the service. The GY-HM250SP’s score overlays for football, baseball, basketball, hockey, soccer, and volleyball can be placed in various screen positions. Camera operators can update the score using an external Wi-Fi connected smartphone or tablet, or receive real-time scoreboard data automatically when wirelessly connected to a Sportzcast Scorebot that is integrated with the venue’s scoreboard. Both the GY-HM250U and GY-HM250SP also feature built-in streaming with Wi-Fi and 4G LTE connectivity that provides live access to CDNs like Facebook Live and YouTube. 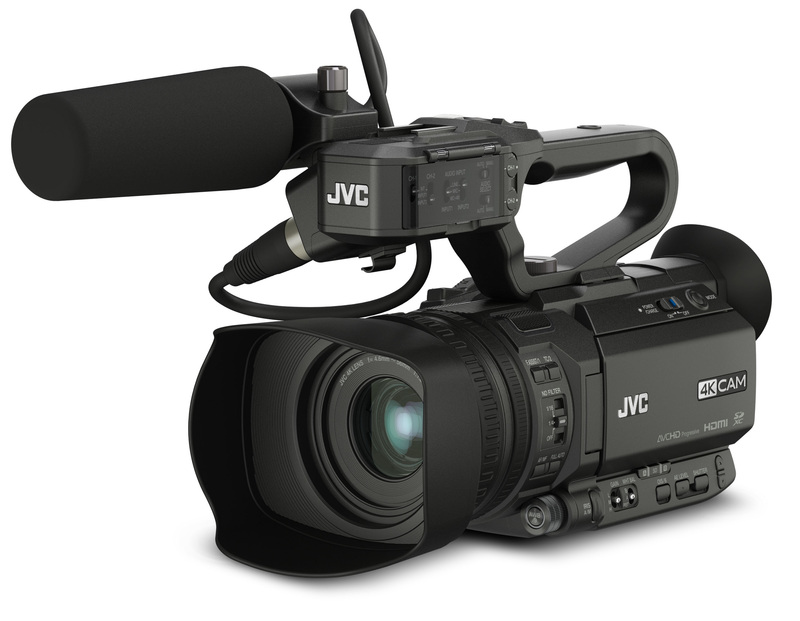 The cameras also work as part of JVC’s S.L.I.M. studio camera system, an affordable approach to multi-camera production that uses the RM‑LP100 remote camera control as a CCU for JVC IP-capable cameras. Other new features include 4:2:2 recording for 4K/30p and 4K/24p, as well as 4K/60p HDMI output. The new tele macro shooting mode on the GY‑HM250U and GY‑HM250SP provides better focus on close objects than previous models, while the new Zero Config function provides automatic, one-click configuration of the camera when it joins the same LAN as other cameras. The new GY-HM250U replaces the current GY-HM200U and GY-HM200HW models, while the new GY-HM250SP with integrated sports graphic overlays replaces the GY‑HM200SP. An upgrade to the popular GY-HM170U, the GY-HM180U still outputs live 4K via HDMI, but also adds a 3G-SDI output for connectivity flexibility. Beyond the upgrades, GY-HM250U, GY-HM250SP, and GY-HM180U retain the professional features valued in the previous 4KCAM models, including a 1/2.3-inch BSI 4K CMOS imager and integrated 12x zoom lens with optical image stabilizer. The cameras record footage in a variety of file formats and frame rates (including up to 120fps slow motion) to economical Class 10 SDHC/SDXC memory cards. Users can record on two cards simultaneously for instant backup or use relay mode for extended recording time. Other features include dual XLR audio inputs, integrated handle with hot shoe, built-in microphone and dedicated shotgun mic mount, and viewfinder and LCD displays. The GY-HM180U has an MSRP of $1,795, the GY-HM250U has an MSRP of $2,245, and the GY-HM250SP has an MSRP of $2,595. All three models will be available in May.